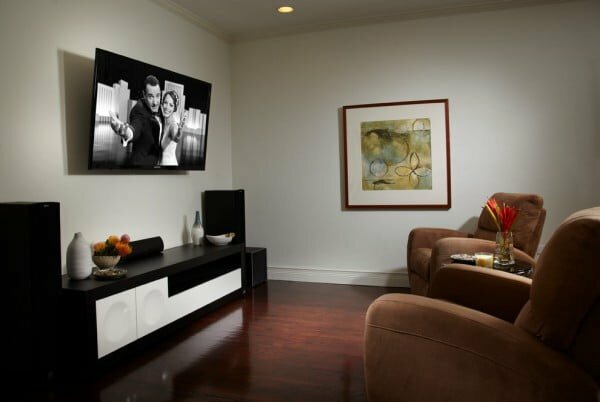 Do you want to create yourself a home theater but don’t know where to start. 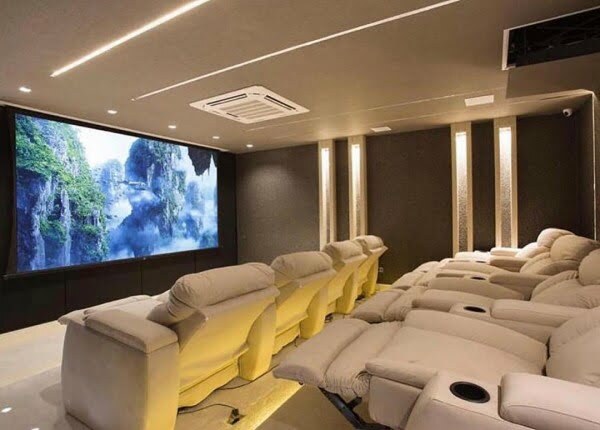 Here are 20 excellent home theater design ideas to inspire you (updated for 2019). I have always dreamed about my personal home theater. A cozy nook where I can curl up with my significant other and watch movies late at night or go on a Netflix binge. It doesn’t have to be fancy, nor does it have to be a separate room. But it has to feature a huge screen and comfy seating with a handy side table for snacks and drinks. Whether that’s your idea for a home theater too, or you want a separate room dedicated to your small cinema, these brilliant ideas will cover all bases. 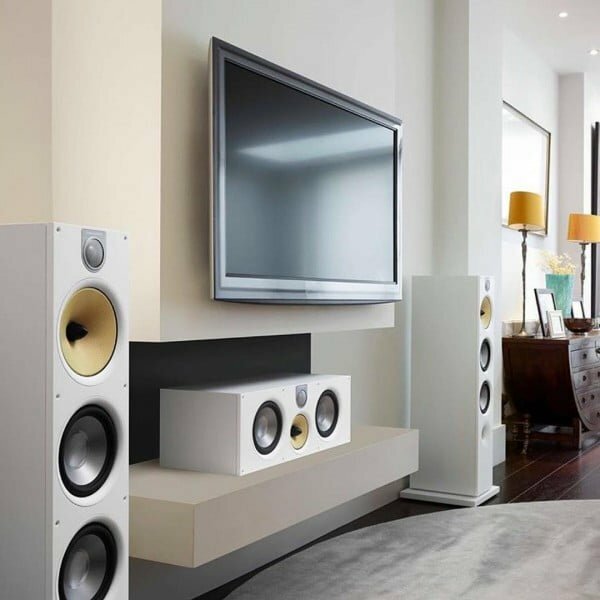 Check them out to see how you can turn a simple living room into a home theater, or build a luxurious home cinema. This simple but beautiful family room turned home theater design is warm but modern. 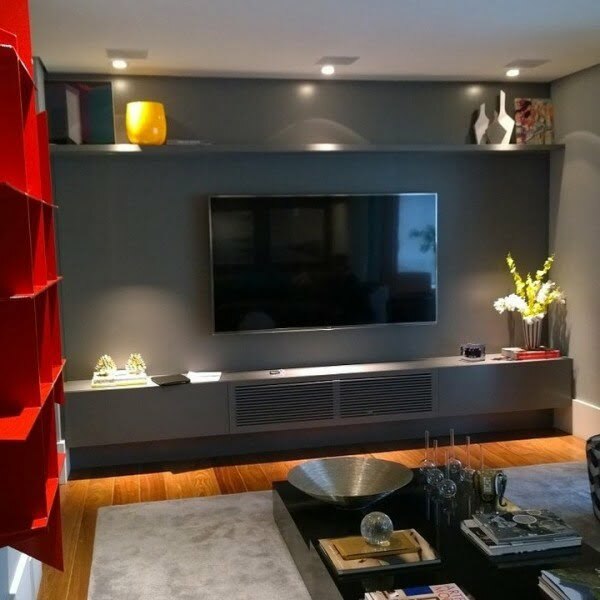 We can see the black modern TV console furniture and brown transitional armchairs with a small side table. It’s a cozy movie watching nook that two persons can enjoy. 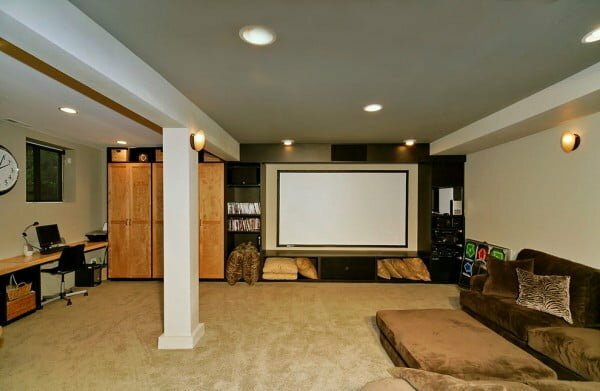 This basement turned into a home theater is a simple but impressive makeover. The area is very spacious and fits a wide screen TV with ample sofa seating space for the whole family or a group of friends. 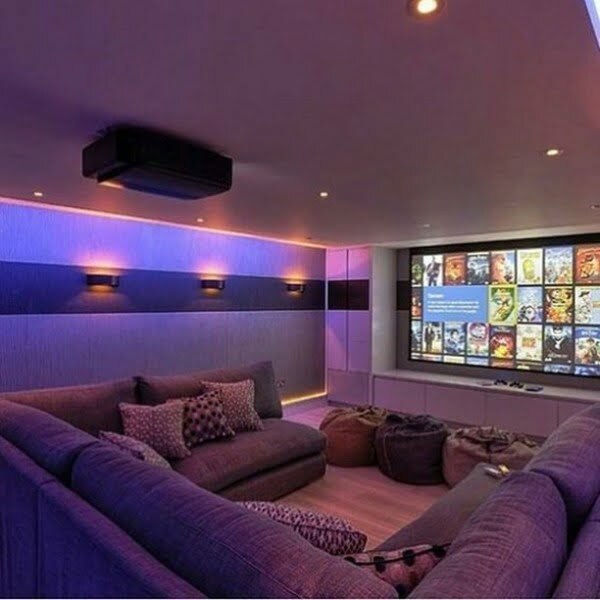 This home theater design is truly impressive. It features a huge TV and plenty of comfortable seating. It makes quite a mini cinema at home. These modern recliners are a luxury fit for this home theater design. They provide comfortable seating in distraction-free space. The room also features a movie projector which is a great solution for a home theater. Talking about luxury, this Mediterranean style penthouse has a stunning home theater. All natural wood walls, natural leather chairs, and a massive wall mounted TV make a winning combination in class. 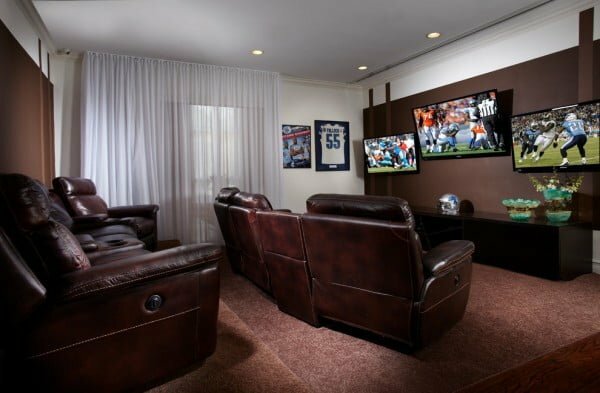 The inspiration for this mid-sized “man cave” features enclosed carpeting with brown floor home theater remodel. The red wall and projector screen add to the theme of this Miami contemporary room. This large contemporary in Orange County, CA, features a beige floor with cutting-edge A/V home theater remodel components. Perfect for lounging around and enjoying movies with family and friends on the large projector screen. This industrial home theater remodel in Atlanta features a spacious and cozy interior. 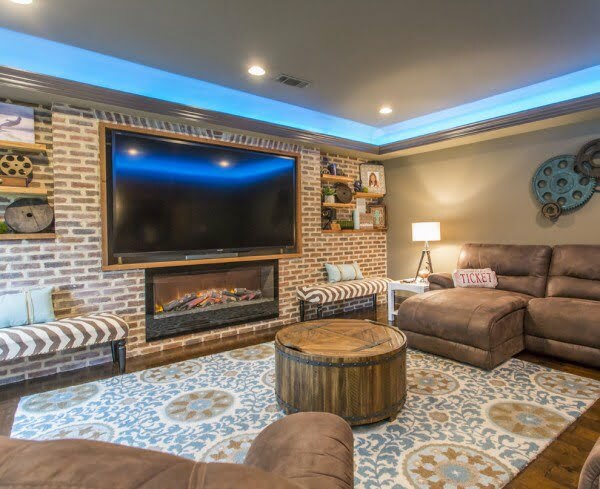 The large LED projector screen and blue light ceiling trim add to the allure and essence of this unique media room. 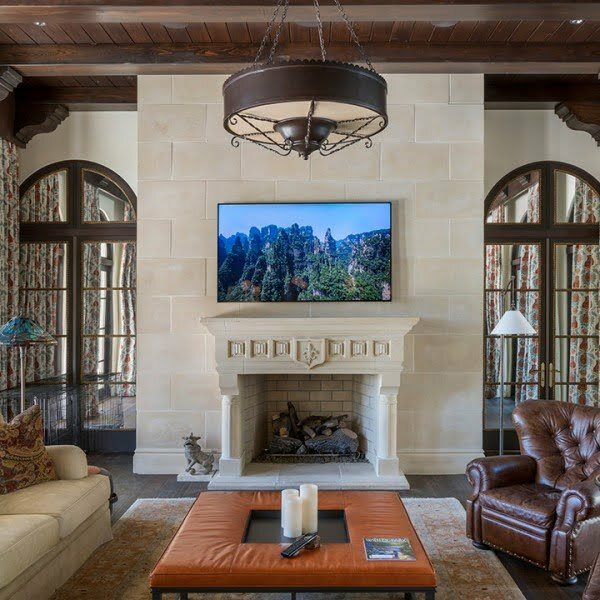 This transitional home theater remodel in Dallas showcases a contemporary entertainment center with large TV and cabinetry. Enough room to store your favorite DVDs, CDs and media items for great entertainment at any time of the day. This eclectic home theater design in Minneapolis features a wooden-based theme with large projector screen and surround sound. Great contemporary room with a traditional feel to it. 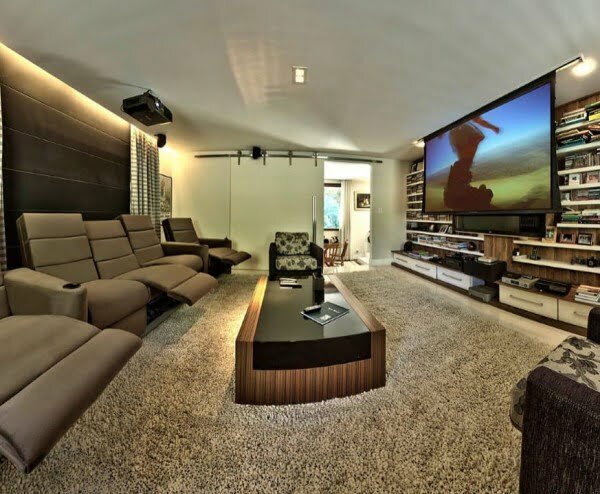 This home theater design in OC features an enclosed carpet with the multi-colored floor. 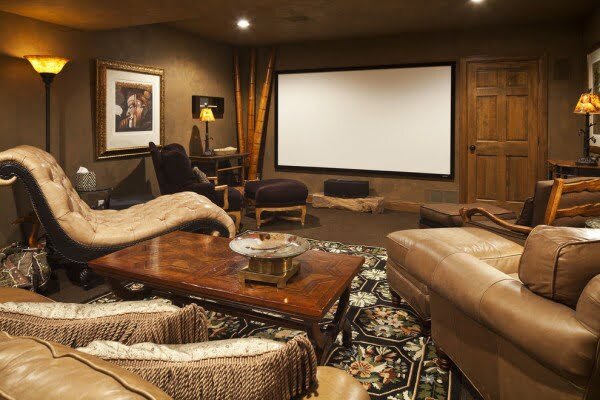 The brown walls offer the perfect contrast with a large projector screen and cozy areas and theater-style seating. 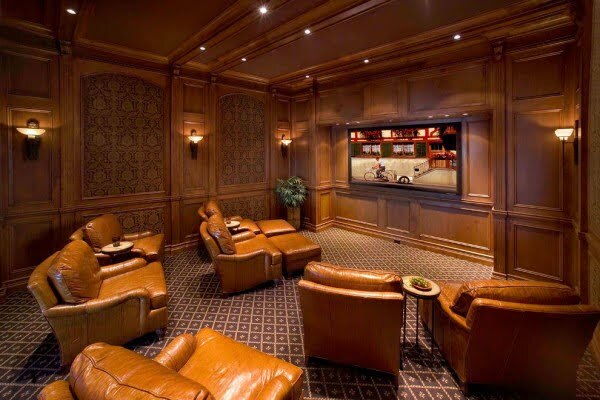 This streamlined and centralized home theater features brown walls with theater-style seating. The large projector screen adds to the overall décor and theme of this fabulously designed room. This sensational room features brown and white walls with a large projector screen and center table. The cozy carpeting and lighting accents emulate the latest in cutting-edge and innovative home theater designs and concepts. A spectacular media room fitted with large HDMI TV and soothing brown wooden frames and trim. 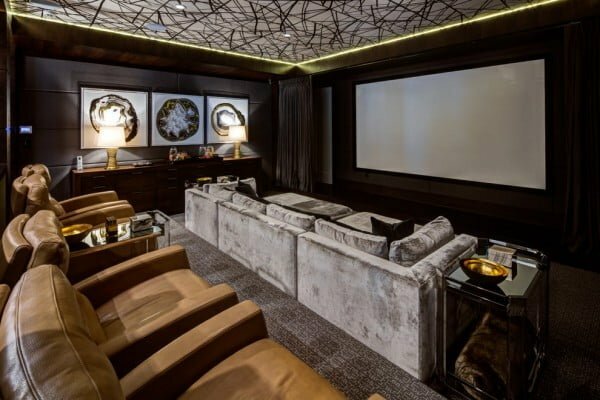 The gold style wall panels and grey furniture captures the perfect contrast for this home theater room. 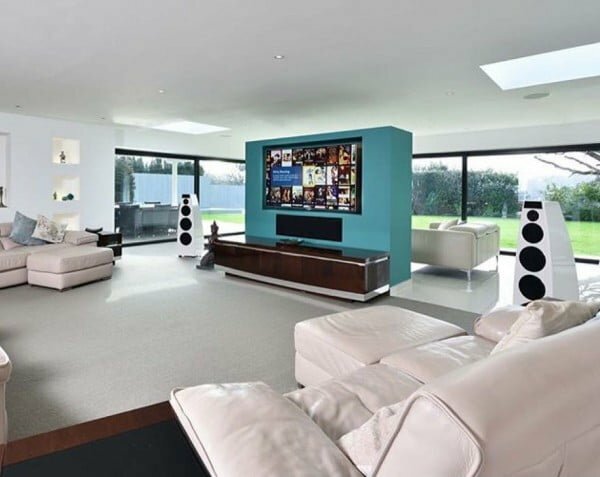 This contemporary and modern home theater features large visible speaker and mounted LED wide-screen TV. The dark brown flooring and white walls capture the true gist of aesthetically—pleasing visual with lavish and elegant designs. 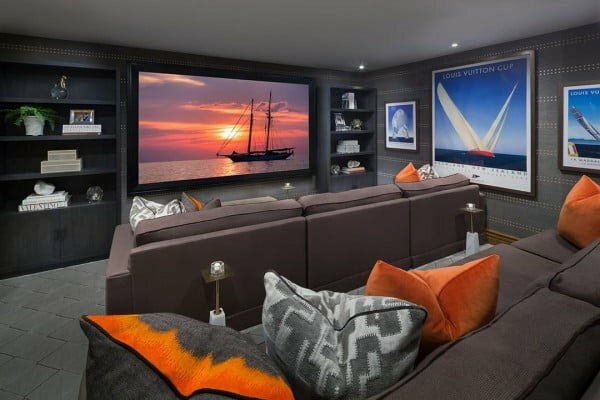 This Toronto home theater project captures soothing mood lighting tones and accents. 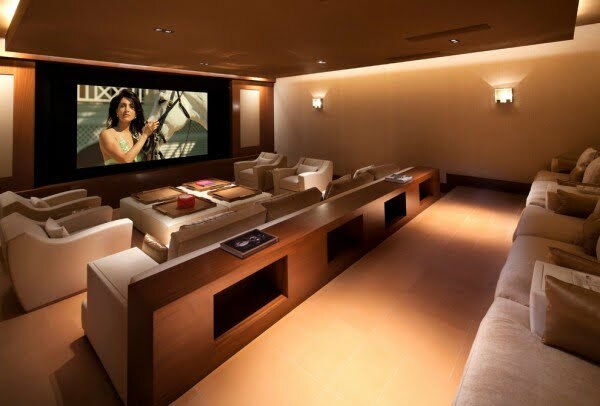 Another example of how important lighting is for any home theater or media room design and remodel. 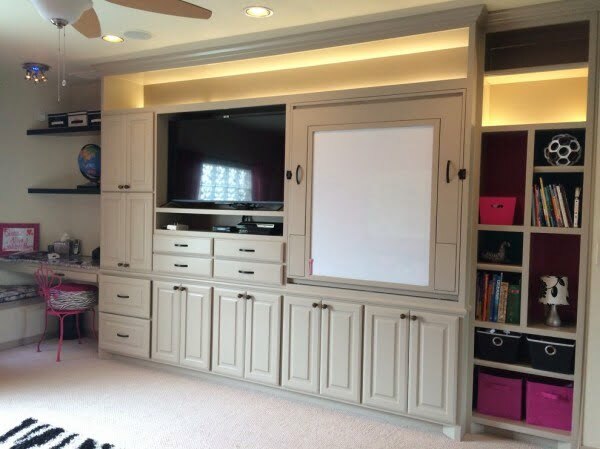 This is a great example of how multi-colors contrast well with home theater remodels. The large TV is centered or grey walls with brown flooring, red shelving, and cool grey/white furniture and accessories. 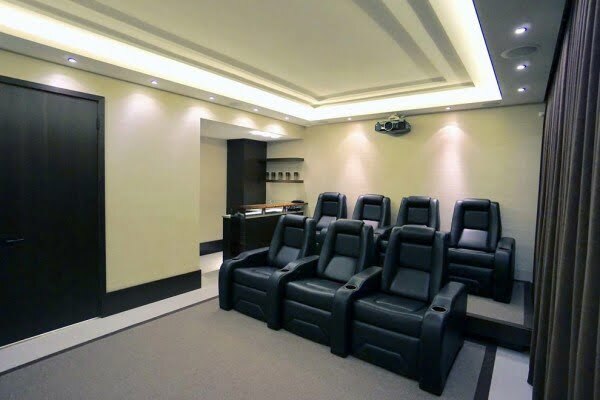 This home theater design room makes great use of space. The large projector is placed in the center of the room with turquoise trim that contrasts well with white flooring, furniture, and black trim windows. 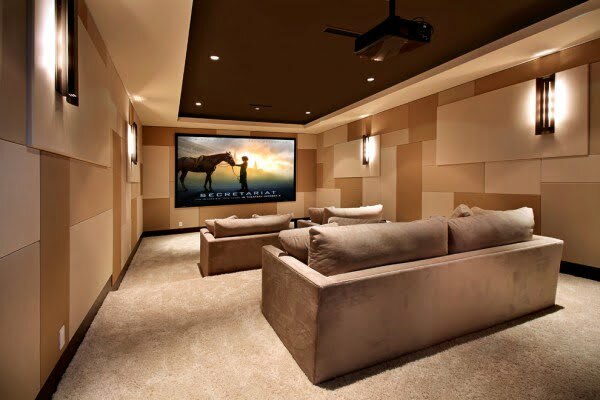 Audio Images in Tustin, CA, created this awesome home theater room with a large projector screen. The dark grey walls and flooring with shelving offer a sense of comfort and convenience in this greatly designed media room. This home technology award-winning project is courtesy of ZIO Connects. A unique media room with large LED/HDMI TV placed on a wall mount above the cozy fireplace. 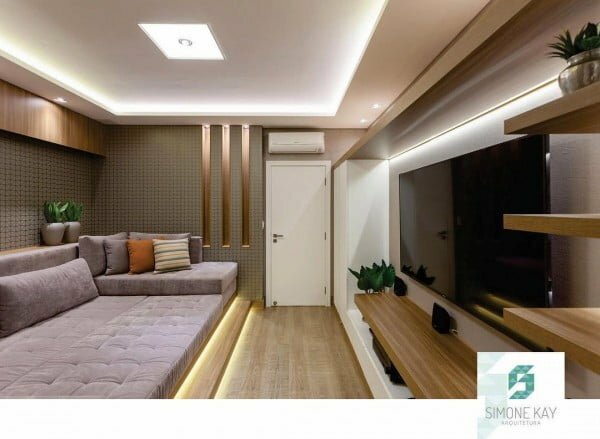 The chandelier with beige, white and brown colors makes this TV room truly comfortable and trendy.